Cake & Heels: Popin' Cookin' Sushi - "Intellectual Education Candy"
Popin' Cookin' Sushi - "Intellectual Education Candy"
There is a type of sweet in Japan that’s sold under the category of "intellectual education candy". These are sweets you must make yourself using the ingredients contained in the box. This way, children can enjoy the process of making candy, which allows them to develop their creativity. The first sweet of this sort was Neruneru-nerune and it was launched on the market in 1978. The candy was very easy to make: you just had to mix several ingredients in a bowl, and watch them change colors. Following this candy, many similar products appeared and, little by little, this type of sweet has evolved and has been reinvented. Thirty years later, it has reached its ultimate expression: Popin'Cookin', a series of candies that are very complicated to make. The series includes 4 different products, including one that shows you how to "cook" pieces of sushi or different types of pies, and one that you can use to make soft-candy dolls that look like they’re made of Play Doh. Although these sweets don’t look very healthy, they actually use only natural coloring, such as red cabbage, and they take advantage of color changes due to differing pH levels. So, actually, they’ve also been designed to promote health. I mean, seriously, after reading this review, how could I not try and make them? I mean really, intellectual education candy? That's designed to promote health? It's things like these that make me really appreciate my heritage. Also, the box is super awesome. Really it was the Ikura that attracted me to this kit, I couldn't comprehend how it was going to work. When you open the package, there's a nifty little tray and a ton of packets of "candy mix." Since my japanese isn't quite up to par with reading a package (or in fact non-existent) I had to rely on the cute little drawings to figure out what goes where. At the end of the day, it wasn't rocket science. Mix water & packet in the corresponding number tray. A little color by numbers if you will. The rice was the first one up. It turned white & fluffy & really had the right texture of a rice ball. Weird. Then the tuna & tamago. I messed up a little on the tuna & didn't add enough water, so when I tried to pull it out it fell apart a bit. 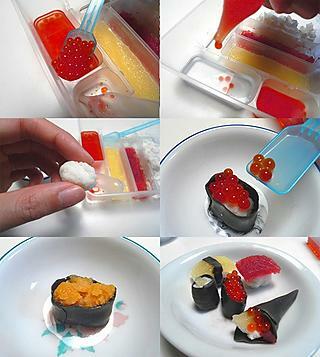 Really the coolest thing was making the ikura! Two separate packages. One I imagine had the calcium gluconates and the other an algin bath. When I dropped little balls of the orange mixture into the algin bath, it formed a little sphere, one that popped in your mouth when you bit into it! It looked so real, it was amazing.